Elmira Street Painting Festival is a family fun festival hosted by Elmira Downtown to celebrate the rich arts community located in our area, and to bring the art to the community, all while creating downtown Elmira as a destination place for the region. This two-day celebration of ART came to life in July of 2008. With the positive transformation of downtown Elmira, the goal of the organization was to have our local residents and visitors rediscover our city and bring awareness to our locally owned restaurants, stores, and other businesses. 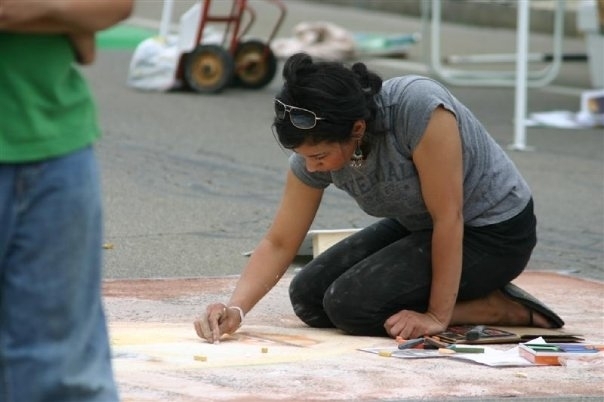 Within this event, local and regional artists use the pavement as canvas to transform downtown Elmira streets. The Streets literally become a gallery of ART. Our Artists come together to display their diverse talents on the asphalt - using only chalk in styles that range from Renaissance classicism to Cubism, Pop Art to their own creative style. These concrete masterpieces are left on the sidewalk for the public to enjoy until the rains come down. In addition to the street art, musical entertainment adds to the creative setting. And of course, don't forget to stroll through the Elmira Street Painting Festival Arts and Craft Show to discover our local talented artisans. A location within the festival dedicated to the children of our community. This offers our aspiring young artists a place to have fun, and be creative at the same time. In addition, there will be face-painting, ice cream, popcorn, Bobby K entertainment, and many other kid's activities. A personal square is available for those who are interested in creating their own masterpiece. These squares are available for our future young artists. During the festival local bands, musicians, and other performers entertain the artists and the public. A list of performance times is posted near both of the stage areas.